Recently, I found that I still had quite a few packs of gluten-free flours in the back of my fridge, including 2 packs of chick pea flour. So, I figured it was time to find ways to utilize the chick pea flour…. I discovered that I could use chick pea flour as a thickener for sauces and soups. I’d never thought of that! I used it in place of wheat flour to thicken some shepherd’s pie filling, and it turned out wonderfully. Then, after my success with making Coconut Flour Chocolate Chip Cookies and quinoa flour Gluten-Free Chocolate Chip Cookies , I wanted to find a simple but good chick pea flour cookie recipe. I wasn’t too sure about this recipe, but I had all the ingredients, so I decided to give it a go. That was about a month ago, and since then, I’ve made these cookies 4 times! Everyone seems to love them because they taste just like regular yummy cookies. No one could guess they were made of chick pea flour. They’re so chocolaty that there’s no hint of chick pea taste at all! 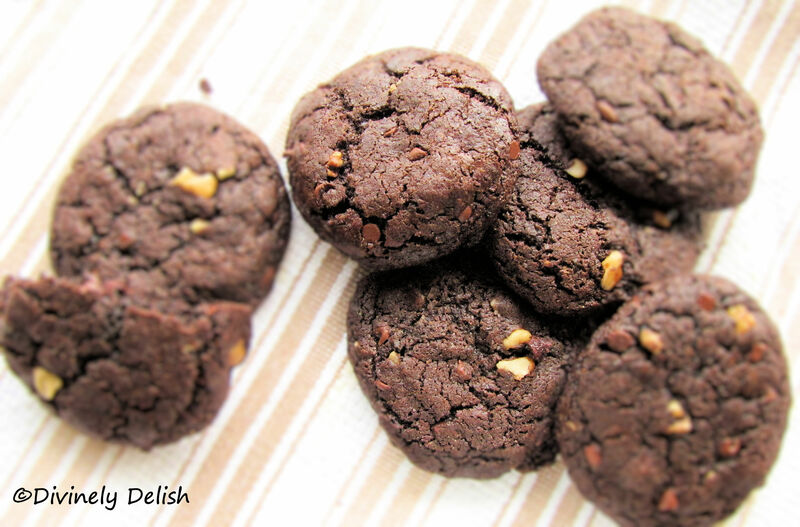 They’re kind of cake-like in texture, but dense, so you still get that moist chewiness (like eating a brownie cookie). Freshly baked is best, of course, when the edges are slightly crispy. If you like a bit of crunchy nuttiness, try adding in a small handful of walnut pieces into the batter. Chick pea flour is full of protein and fiber, and is grain-free and gluten-free. The dark chocolate and pure cocoa powder are full of antioxidants. Coconut oil is a healthy fat, and, although you can use brown sugar, I prefer to use coconut sugar, which is definitely one of the healthier sugars. 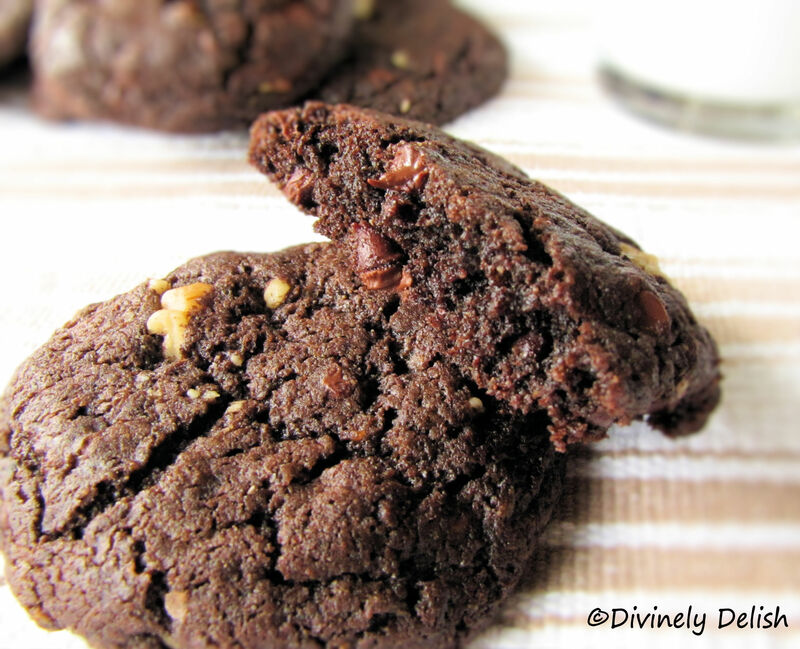 Enjoy these cookies without the guilt! 1) In a medium bowl, whisk together chickpea flour, cocoa powder, baking soda and salt. 2) In a large bowl, whisk the egg, coconut oil, sugar, vanilla and espresso powder (optional) until blended. Add the flour mixture, stirring until well blended. Stir in chocolate chips and walnuts (optional). Cover and refrigerate dough for 30 minutes. 3) Preheat oven to 350F. Line a baking sheet with parchment paper. 4) Roll dough into 1.5-inch balls. Space 2 inches apart on prepared sheet and flatten slightly with palm. 5) Bake in preheated oven for 8 to 10 minutes until set at edges (centers may still look slightly soft). Let cool on sheet for 1 minute, then transfer to cooling rack and cool completely. Repeat with remaining dough.